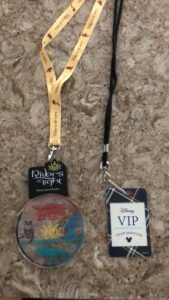 Ultimate Nights of Adventure VIP Tour Review | What's Up With The Mouse? We first told you about the launch of this new VIP tour last September and earlier this year one of Castle Dreams Travel Planners, Stephanie, was able to experience the tour with her family. Cost is $249 per person, plus tax (valid admission is required for each park and not included in the price of this tour) and is currently offered on most nights Rivers of Light is shown, aside from blackout dates. Stephanie’s family met their two VIP tour guides in front of the Dinosaur, inside Animal Kingdom theme park. They were given menus to pick an alcoholic or non alcoholic drink and a dessert from the Satuli Canteen, then they were also given water bottles to walk with. Once everyone for tour was there their tour guides took them on Dinosaur than went went over to Pandora. 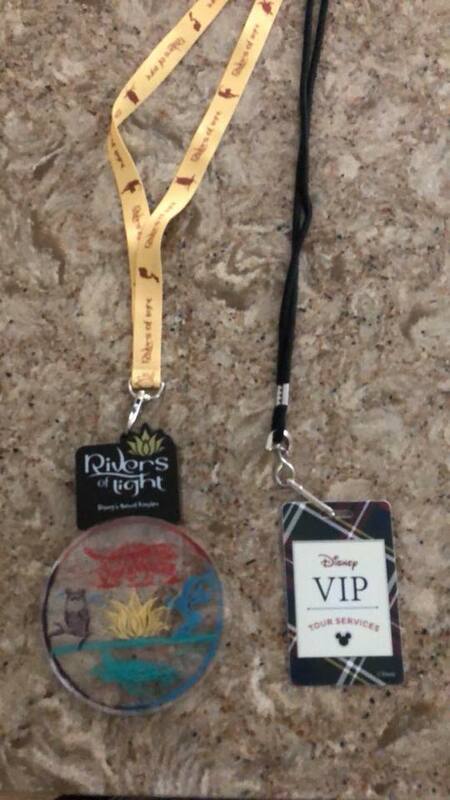 They rode Navi River Journey and then Flight of Passage – taken through the Fast Pass line so they didn’t have to wait. The guides then took them to Satuli Canteen where they had a private area solely for their tour where they not only gave them the drink and and dessert they had chosen earlier but also gave them a sampling of the bowls they serve there which was more than enough food for dinner. The sampling was a surprise, they didn’t know they were getting that much food as they had actually eaten right before the tour. While at Satuli Canteen they were also given a huge water bottle for the rest of the tour and a light up necklace for Rivers of Light later on in the day. After eating they were taken on Kilamanjaro Safaris where the whole tour sat in the same ride vehicle. They then went on Expedition Everest. All rides were through Fast Pass lines and only were able to ride once. The guides went on the rides with them and answered questions along the way and gave info as well. After Everest they sat them in a special VIP area for Rivers of Light which was a fantastic view and not super crowded or packed in. They guides left them once they were all seated for Rivers of Light. The tour is not so much of an informational tour like Keys to the Kingdom or a tour like that it is more for a guest to be able to experience all the popular rides at Animal Kingdom. Stephanie felt it was totally worth the price and her family really enjoyed it as well. They are also super accommodating for guests whole may not want to ride everything, like her parents who didn’t want to ride Everest. They had a guide stay with anyone who didn’t want to ride something and then another guide went with the group on the ride. Stephanie and her family really loved this tour! This entry was posted in Did you know..., Disney Dining, Disney's Animal Kingdom, Disney's Animal Kingdom Park, Mouse Merchandise, Pandora, Private Tour, Something Different, Walt Disney World, WUWTM Recommends. Bookmark the permalink.